The film that has been selected to open this year’s BFI London Film Festival is one that has been a labour of love for one particular person in position of power. While it has been marketed as the directorial debut of Andy Serkis, it is much more of a passion project for producer Jonathan Cavendish, because it focuses on a group of people who are extremely close to his heart; his own parents, Robin and Diana, the latter of whom led a rather extraordinary life indeed. It is that extraordinary life, as well as their life-lasting love for each other, that takes up the focus of director Serkis’ Breathe which, though certainly imperfect and not without a few gripes here and there, is an upbeat and heartfelt account of two people who remained with each other through thick and thin. It begins in 1957 when Robin Cavendish (Andrew Garfield) meets Diana Blacker (Claire Foy) and, after swiftly getting married, they venture to Kenya for Robin’s tea-broking business, where Diana also becomes pregnant with their son. However, Robin soon contracts polio and is left paralysed from the neck down, linked up to a respirator in order to keep breathing. A period of just lying in a hospital bed doing nothing takes a toll on Robin, and Diana resolves to remove him from there and set up their own respirator equipment at their new country home, which against all odds manages to work a charm. From there, they come up with all sorts of exciting methods of becoming more active, such as commissioning their friend Professor Teddy Hall (Hugh Bonneville) to create a wheelchair with a built-in respirator, to converting a car to fit Cavendish’s chair in the front passenger seat, to even boarding a charter plane in said vehicle to go on family holidays. Even more extraordinarily, Robin and Diana would always be there for one another even in times where Robin’s disability would threaten to complicate matters further. From a cynic’s point of view, it would be easy to write this off as an unapologetically Oscar-bait film that was made only because The Theory of Everything was successful. But while that film perhaps went a bit deeper in its exploration of the central romance in that film, Breathe is an entirely different beast with the main focus being on Robin and Diana’s unconditional love for one another, and although their initial coupling can feel a little rushed, especially in the film’s opening moments – one minute they’re just glancing at each other for the first time, the next they’re actually dating, and then the next they’re married and heading off to Kenya – their connection is felt all throughout. These were people who took such a devastating development in its stride and eventually learned to not only live with it, but also on occasion laugh along with it; in this film anyway, there isn’t a moment later down the road where either of them seem to pay much attention at all to the fact that he’s hooked up to a machine, and just treat each other just like any normal loving couple with this entirely coincidental bonus. Garfield and Foy also work rather well together and you do feel their strong bond for each other pretty much as soon as they meet and right up to much later in life. You can see why Jonathan Cavendish was so set on bringing this story to the big screen, as it has the distinction of being not just an uplifting tale of adversity in the face of life-threatening illnesses, but also a sweet and caring tale of two people who were absolutely smitten with each other from the get-go. As far as debut directors go, Serkis does a competent job of framing each scene and setting up their next few exploits rather well, from a humorous extended sequence when Robin’s respirator blows up in the middle of a family holiday to Spain, to more serious explorations of a respiratory clinic in Germany that looks like something out of a Stanley Kubrick film. Serkis also appears to be keen to give this film a very old-fashioned feel, right down to using a 2.76:1 aspect ratio for the film’s entirety, which gives it a widescreen look not unlike an epic film you would see in the 50s or 60s like Cleopatra or Ben-Hur; however, this film is as far away from those genuine epics as you can get, but the impact of the story is no less powerful. As for Serkis’ tendency to keep at his pioneering visual effects work, it’s shocking at how little of it he really uses for this film; in fact, the only real technical wizardry on display is that of duplicating Tom Hollander as he plays twin brothers that appear side by side, a trick that has been used countless times in cinema over the years and remains a pretty neat trick to this day. Maybe he’s saving his big guns for his in-production motion-capture version of The Jungle Book, but with this film he proves that he can at the very least make a much more traditional film just fine. The only problems one has with this film mostly lies in some of its pacing, including the opening few moments which don’t take as much time to develop Robin and Diana’s early relationship to set things up for much later, and especially in its extended third act that does seem to go on for quite some time. These are certainly gripes, but they don’t completely take away from the emotional impact that this main story has, and it is certainly an emotional and heartfelt exploration of not just a triumphant case of surviving polio for so many years, but also of two people who despite facing the worst possible odds overcame them all thanks to their love and dedication for each other. 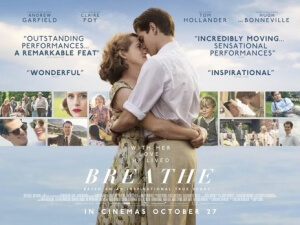 Breathe is an upbeat and heartfelt exploration of the life of renowned polio survivor Robin Cavendish and his wife Diana, and despite a few pacing issues Andy Serkis makes for a fine debuting director when showing these accomplishments play out on the big screen.